I can still remember laying on my childhood bed at my dad’s house, at 25 years old, reading “He’s Just Not That Into You”. I had moved home for the summer from Boston so that I could work full-time on completing my graduate thesis at Harvard. And, I was moving through some serious heartache that shook my confidence to its core. My mom knew all about the situation with this guy, so she bought me a copy of “He’s Just Not That Into You” which I devoured hungrily. And what a freeing concept! He just wasn’t that into me! I could deal with that. I was determined next time I met a guy to do things differently. To have confidence and assurance in myself. To hold strong to my boundaries. To show him that he needed to be deserving of me, not just the other way around. Well…I did all of that. And it worked. I knew this guy was into me, and we were together for about a year. 1. He shows up for you. The guy in Boston who just wasn’t that into me didn’t show up for me. I felt like I always had to scheme or devise plans in order to meet with him. We worked together, so we felt we had to be a bit more secretive, but if a guy really likes you he’ll show up. He’ll text or call before you have plans and he definitely won’t ghost you. 2. He acts differently around you. When a guy really likes you, he’ll act differently around you than he does with other people. If this guy is just trying to play the game, then he may be super friendly and flirtatious with you, but chances are that he’s the same way with any other woman he talks to. But if he behaves differently with you than he does with anyone else, it’s a sign that he holds you in a different light. Maybe he gets a bit more nervous around you or starts fidgeting. Maybe he’s occasionally at a loss for words when talking to you, or he makes an extra special point to swing by your desk when he knows you’ll be getting up for lunch. 3. You know as much about him as he knows about you. He shows an interest in who you are. He asks you questions about yourself, your family, or your life. He genuinely seems to want to know and listens with intent. On the flip side, when you ask him about himself, he doesn’t give just vague or general answers which usually is an indicator he’s trying to keep you at a distance. Some guys aren’t that talkative, and that’s okay, but when you ask him questions about himself you feel that he’s giving you honest, open answers. 4. He gives off strong body language signs. No matter how cool a guy is trying to play it, his body language is a huge indicator whether he likes you. If a guy is into you, his body language will show it automatically. One main thing a guy will tend to do if he likes you is take up more space. This is a dominant body language cue that men subconsciously do when trying to impress a woman or be seen as the alpha in a group of men. If standing they’ll have their feet spread apart wide and arms crossed or on their hips. When sitting they will take up more space by leaning back in their chair with their arms crossed behind their head and may have one foot crossed over the knee, called the alpha cross. Another body language sign to know if a guy really likes you is that he will have his body pointing towards you when he’s around you. His feet and torso will point towards you and he may lean in when you’re talking, or casually touch you such as brushing your shoulder or quickly putting his hand on your knee. 5. He tells other people about you. If anyone in his life knows anything about you, it’s a good sign. 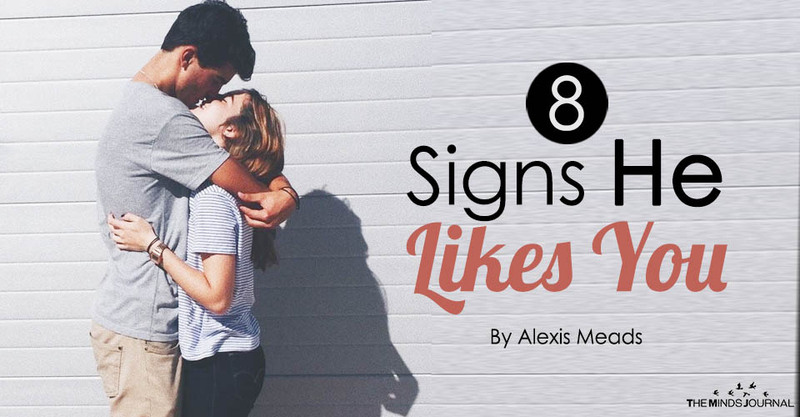 When a guy really likes you he’ll tell other people about it, especially if you’re already dating. If he introduces you to his friends or asks you to hang out with them once in a while, that’s a sure sign that he’s into you. You may not want to hang out with his friends all the time, particularly if they’re a group of partying bachelors, but they should at least know about you. And how they treat you when you’re around is a strong sign whether he’s spoken highly of you, or if you seem to be the flavor of the month. When a guy likes you, he’ll be excited about it and sure to tell other people in his life.